 Keep an eye out for the National Launch of the cabinotch® full access Cabinet Library for KCD in your version of KCD TODAY (Tuesday, March 28th, 2017). If you don’t have the Maintain KCD Automatically checkbox checked in KCD (go to Help, About KCD and look in the bottom left hand corner of that dialog box), make sure you either go check that box, or go Click on the Online Update option under Help in the File Menu. If you are unsure about whether you have gotten the update yet, just look at the splash screen when KCD opens, if you see the banner shown below, you have entered the Promise Land. 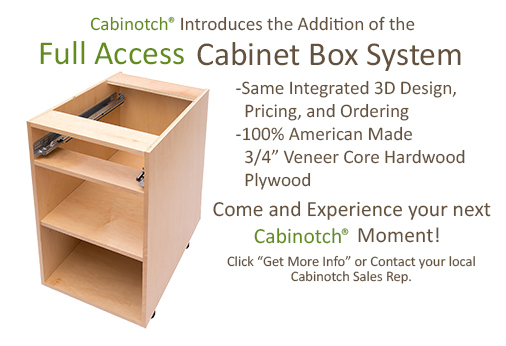 Charles, currently you need to use KCD Design Software to order Full Access Cabinetry from Cabinotch Innovative Solutions, but we are working on adding the Full Access line to the Cabinotch WebStore as well (that is probably a few months out yet). The KCD solution will provide the most flexibility though, and is what I would recommend if you are a custom cabinetmaker. If you are a homeowner just wanting to do a single bath or kitchen, then renting a KCD key might be a viable option as well (we can get you a KCD key that you can rent for one month, or from now on). Feel free to visit our Contact Us > Team page and reach out to the appropriate Sales person for your area of the country.